... and apparently blind, too, because according to LP, he wouldn't move his legs as people came down the stairs. And therefore wound up in the hospital with knee damage because people pushed by anyway. Or at least I would have and made it as painful as possible for him. Me? A running jump with a chainsaw. No problem-o. I get that. I just schlepp too much stuff with me to bother with the chainsaw. If only they made them small, compact, backpack sized. I would have clipped him with my laptop case. Serve the douche right. My laptop case surrently contain a laptop (duh) but also several file folders, my Kobo and a table, all wrapped up nicely to avoid damage. oops should be tablet, not table. All my tables stay home. i was going to say...TABLE?????? 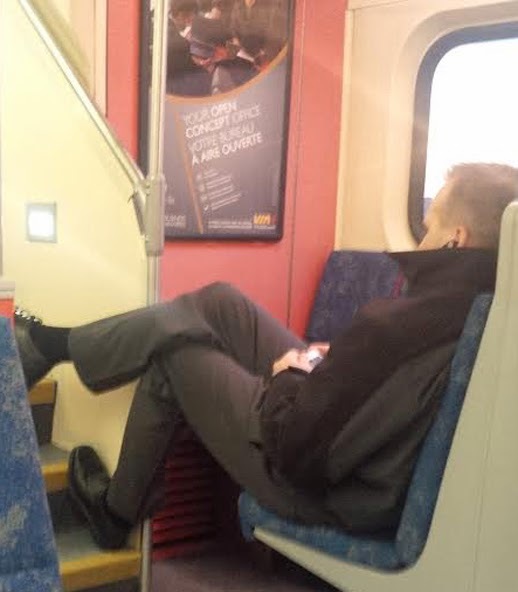 maybe you should carry a table for guys like this :) however im tall and i dont do that... and btw it can get uncomfortable sitting on go trains, i dont have much leg room even less than on airplanes.. sometimes id wish theyd get rid of the facing seats... and have more like bus seats... but what can you do?